Posted 11/29/2018 9:28pm by Leslie Cooperband or Wes Jarrell. It’s been a roller coaster ride out of and into winter this week. From balmy mud and pasture-grazing goats one day to snow-covered frozen tundra the next day, it’s a challenge for the body to adapt. It felt like I boarded a plane in autumnal Georgia and landed in mid-winter Alaska. The goats’ response to the brusque drop in temperature—stay very still. Mostly pregnant, they protest ever louder over their twice daily milking duties. Their dwindling milk, ever richer, ferments into curd so dense and massive, it hurts my forearms to ladle it out of the vat. The farm is getting ready for the rest that winter will provide. Four wagon-loads of grass hay arrived this week, some bales stacked so precariously, they teetered on the brink of falling over. One by one, they were hoisted onto the bale elevator to ascend to their temporary resting place inside our hay loft. Soon, the milkers’ diet will shift from rich alfalfa bailage to dry grass hay; the leaner forage will fuel their rumens and keep their bodies warm as their babies grow inside them. 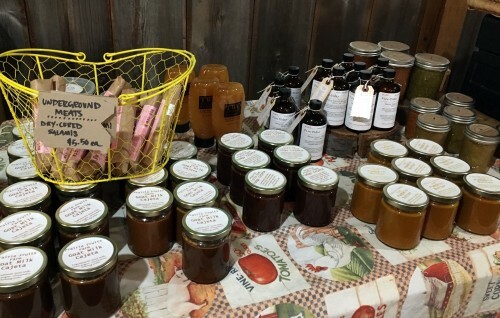 Beat the holiday shopping crowds—come shop at our farm store! Remember: We won’t be back to the Urbana Market in the Square until Saturday, December 22nd. SO, come out to the Farm and shop. If you think our farm is far from town, in fact, we are REALLY close to Champaign-Urbana—literally 5 miles from each downtown. We are also within two miles of both I-74 and I-57. Follow direction on our website if you’re not familiar. 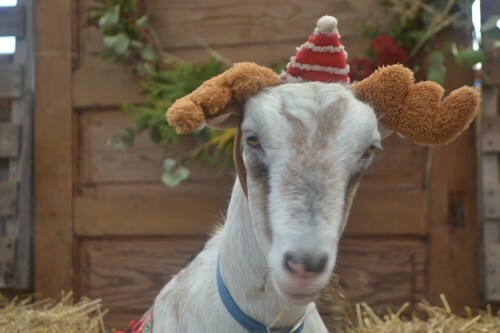 Bring your friends, your family or just yourselves and have your pictures taken with our festive holiday goats. This year, we are taking high quality digital photos (using digital cameras, not phones) for visitors and charging $5/photo. We’ll get your email address before we take the picture and then email you the pictures to craft your holiday cards or digital holiday photo greetings. Please note it takes us several days to download and organize the pictures. We try to send pictures no later than the Wednesday following picture taking. Goat Milk Feta: Our flavorful and tangy feta is aged and packed in a whey brine. It's perfect to crumble on a fall salad or a top a hearty stew or bowl of chili. Try it on a home-made pizza too. Little Bloom on the Prairie: This batch is has achieved that perfectly gooey ripe stage. 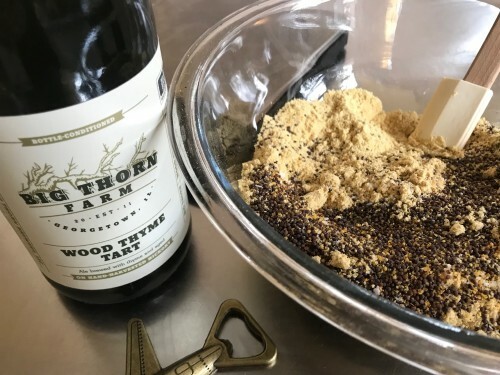 It’s perfect for a “brie en croute” or baked with your favorite cheese accompaniments—sliced apples or pears, one of our savory sauces (pear chutney, salsa verde), chopped nuts, local honey—the possibilities are endless. These rounds are the last ones in the house, so get them while you can. Black Goat: an ash-coated bloomy rind cheese with a delicate and crinkly yeasty rind. This final batch of the season has wonderful yeasty aroma and a tart lemony taste. It is ripening nicely. Try serving it with one of our house-made jams (red currant or rhubarb are my favorites). Apples from Red Crib Acres (formerly Wolfe Orchard, Monticello, IL) Winesap (one of my favorite late fall varieties) and Galarina (a French Gala variety). 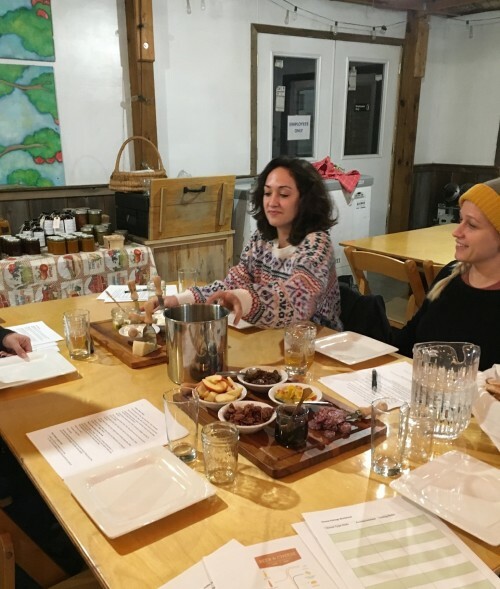 Weeknight Classes It’s not too late to sign up for our final cheese-centric class of the season-Wednesday, December 12th, 6-8 pm. Bring some friends and enjoy an evening of cheese, accompaniments and wine & spirits. We’ll show you how to craft an eye-popping holiday cheese board and pair with wines and spirits. You’ll learn something AND have a lot of fun. Registration is required and seating is limited to 30 people per class. Sign up NOW!